Dubai, UAE, August 16, 2016: Families come together from far and near to celebrate the joyous festival of Eid Al Adha in their own special way. Whether you have your heart set on a relaxed beach holiday, a quick getaway within the UAE or a staycation in one of Dubai’s top family resorts, JA Resorts & Hotels has exactly what you’re looking for. Experience a fun filled holiday and create new memories with your family and loved ones with the latest offerings across JA Resorts & Hotels properties. No summer escape is complete without a luxurious stay at one of JA Resorts & Hotels’ exquisite Indian Ocean island properties in the Maldives and Seychelles. JA Manafaru, voted amongst TripAdvisor’s Top 3 most popular hotels in the Maldives, is the perfect haven for both couples and families looking for a relaxed and luxurious retreat in the sun. Relax on the beach front in a stunning Beach Bungalow, enjoy the resorts’ lavish facilities and entrancing activities and indulge in exquisitely prepared delicacies at one of the resort’s award-winning restaurants. The current ‘Kids Go Free’ offer is valid till April 30th, 2017, and allows children up till the age of 15.9 years to stay free when accompanied by their parents, this offer is open to all villa types. Enchanted Island Resort in Seychelles is an island paradise with ten luxurious private villas that make it an ideal romantic destination for couples seeking a haven of luxury and relaxation. The secluded five-star boutique island hideaway is a hidden gem in the Indian Ocean. Surrounded by white sand, turquoise water and lush tropical flora, guests to the resort can experience tranquility amidst the most spectacular surroundings. If you’re looking for an escape to a tranquil destination without having to get on a plane, JA Resorts & Hotels has a line-up of the best staycation offers for you. From a family friendly beach-front resort to a picturesque mountain retreat, JA Resorts & Hotels offer a unique holiday experience right here in the UAE. Award-winning JA Jebel Ali Golf Resort offers stays at both the all-suites JA Palm Tree Court and JA Jebel Ali Beach Hotel this Eid. Get the most out of your stay with engaging and relaxing leisure facilities including Elemis spa treatments, horse riding and tennis sessions, water sports and access to JA Wibit Water Park. JA Jebel Ali Golf Resort has also partnered with international childcare group Worldwide Kids to bring world-class daycare services and activities for children of all ages, leaving you to unwind without having to worry about entertaining your little ones. JA Palm Tree Court, a lavish five-star property situated on the shores of a palm-lined beach, provides an array of family-friendly features in a casual luxury atmosphere. The Residence is the epitome of luxury, comfort and choice at JA Palm Tree Court; housing a limited collection of spacious 2-bedroom suites, 1-bedroom suites and junior suites where guests can enjoy special complimentary amenities and preferential treatment. 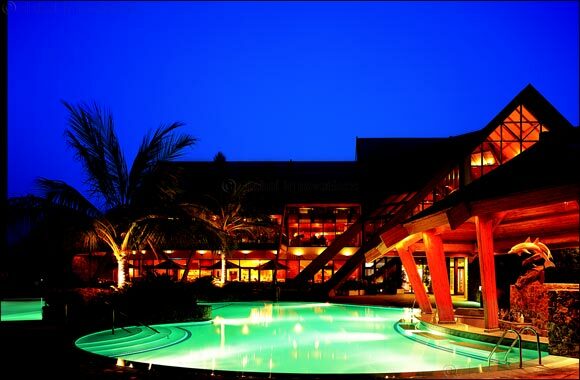 JA Jebel Ali Beach Hotel is the other beach front property located at the JA Jebel Ali Golf Resort. The five-star beachfront hotel is made up of rooms and suites with several interconnecting options that cater for families with kids. The spacious balconies and terraces overlook amazing views of the golf course, gardens, marina, beach and Arabian Gulf. Just an hour’s drive from Dubai, lies the mountain retreat of JA Hatta Fort Hotel, nestled in the heart of the Hatta mountains. For families, the resort offers spacious living areas with either a balcony or a terrace overlooking the landscaped gardens or a breathtaking view of the Hajar Mountains. Various dining options are available to suit different tastes and satisfy guests’ culinary desires during their stay along with facilities to keep guests busy including a fully-equipped gymnasium, a field and target archery range a mini-golf course and 2 temperature controlled swimming pools. There’s nothing like staying right at home with JA Resorts & Hotels. The two properties at JA Resorts & Hotels located on “The Walk” have the best offers to make your stay feel like the ideal city break. The vibrant four- star hotel offers a mix of beautifully designed rooms and suites spread over 25 floors, all with breathtaking sea views which guests can enjoy from the comfort of their own balcony. Restaurants and bars at the hotel provide plenty of choice and the hotel is equipped with an array of sports and leisure facilities including a swimming pool, gym inclusive of Speedflex facilities, spa and beauty salon. The hotel is perfect for families with a CoolZone kids’ club for youngsters from ages 3 to 12 and babysitting services. FREE ACCESS INCLUDED: COOL ZONE FOR THE KIDS 02-12 YRS. JA Oasis Beach Tower, the deluxe hotel-apartment tower, offers spacious, luxury serviced apartments with facilities suitable for your whole family. All apartments have full access to hotel and housekeeping services, in addition to a variety of other facilities which include a pool, a Jacuzzi, waterslide for kids, the gymnasium and the ChillZone teen’s club for youngsters between 8 – 16 years. The hotel also provides complimentary shuttle services and private beach club entry to JA Jebel Ali Golf Resort, and it is attached to a shopping area.